The Anambra State Police Command has commenced investigation into the circumstances surrounding the death of a female student of Nnamdi Azikiwe University,Awka, whose corpse was discovered on Saturday, August 12. A video which has since gone viral shows the decomposing corpse clutching what appears to be an electronic item. According to an eyewitness, the deceased’s lodge mates became worried when they didn’t see her for four days. Moreover, foul odour was emanating from the victims’ apartment and huge houseflies hovered over the door. With the combined effort of the residents in the area, the door was broken down and her decomposing body was found inside. Police are not ruling out anything at this stage of their enquiry. 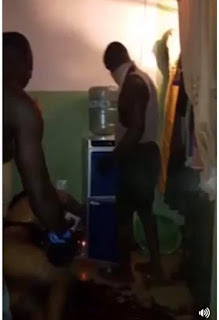 However, some of the neighbours who live on the same floor claim that they heard the sound of her generator all night pointing to death caused by inhalation of fumes, while others are pointing to foul play as the victim was found in a pool of her own blood.